These disposable nitrile gloves offer many benifits over other latex or vinyl gloves. These professional grade heavy duty disposable gloves are used by mechanics all over Canada. They’re textured exterior and superior build make them the perfect gloves for tough greasy jobs. 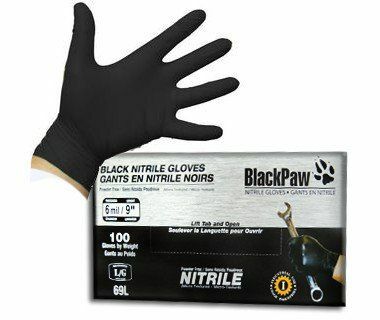 We’ve sold many types of disposable gloves in the past and have discovered that these black paw disposable nitrile gloves are the most loved by our customers. Nitrile gloves offer a lot more than traditional latex or vinyl gloves. To make sure you have the right fitting nitrile glove, you will need to measure your hand. Wrap a tape measure around the widest part of your palm. That’s usually right where your thumb meets your palm. measure completely around your hand. Whether it’s in metric or standard, we have the conversion below. Always choose the the correct size glove to make working with them that much easier. These nitrile gloves have plenty of different applications. Heavy duty nitrile disposable gloves are great for gardening, working in kitchens, and medical use. Since they are latex free, they can be safely used by people with latex allergies. Fanatastic quality gloves! The only ones I use in my garage. My wife uses them for gardening in the summer.